Discovery of hydrogen-rich apatite in lunar rocks hinted at more watery past. Think again, says UCLA's Jeremy Boyce. Boyce and his colleagues created a computer model to accurately predict how apatite would have crystallized from cooling bodies of lunar magma early in the moon's history. 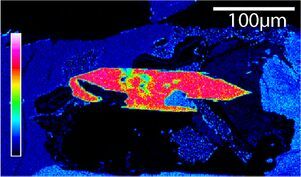 Their simulations revealed that the unusually hydrogen-rich apatite crystals observed in many lunar rock samples may not have formed within a water-rich environment, as was originally expected. "The mineral apatite is the most widely used method for estimating the amount of water in lunar rocks, but it cannot be trusted," said Boyce, who is an adjunct assistant professor in the UCLA College of Letters and Science. "Our new results show that there is not as much water in lunar magma as apatite would have us believe." For decades, scientists believed the moon was almost entirely devoid of water. However, the discovery of hydrogen-rich apatite within lunar rocks in 2010 seemed to hint at a more watery past. Scientists originally assumed that information obtained from a small sample of apatite could predict the original water content of a large body of magma, or even the entire moon, but Boyce's study indicates that apatite may, in fact, be deceptive. Boyce believes the high water content within lunar apatite results from a quirk in the crystallization process rather than a water-rich lunar environment. When water is present as molten rock cools, apatite can form by incorporating hydrogen atoms into its crystal structure. However, hydrogen will be included in the newly crystallizing mineral only if apatite's preferred building blocks, fluorine and chlorine, have been mostly exhausted. "Early-forming apatite is so fluorine-rich that it vacuums all the fluorine out of the magma, followed by chlorine," Boyce said. "Apatite that forms later doesn't see any fluorine or chlorine and becomes hydrogen-rich because it has no choice." Many scientists theorize that the moon formed when a giant impact tore free a large chunk of Earth more than 4 billion years ago. If this "giant impact" model is correct, the moon would have been completely molten, and lighter elements such as hydrogen should have bubbled to the surface and escaped into space. Since hydrogen is a key component of water, a moon formed by a giant impact should be dry. The majority of lunar samples are in fact very dry and missing lighter elements. Yet hydrogen-rich apatite crystals are found in a whole host of lunar samples and have presented a paradox for scientists. Somehow, despite the moon's fiery beginning, some water and other volatiles may have remained, though perhaps not as much as apatite initially implied. "We had 40 years of believing in a dry moon, and now we have some evidence that the old dry model of the moon wasn't perfect," Boyce said. "However, we need to be cautious and look carefully at each piece of evidence before we decide that rocks on the moon are as wet as those on Earth." "We're knocking out one of the most important pillars of evidence regarding the conditions of the formation and evolution of the moon," Boyce said. "Next, we plan to determine how badly apatite has distorted our view of the moon and how we can best see past it to get at the moon's origin."